Approximately 8,000 square feet of decorative laminated glass comprise the the exterior walls of this world headquarters corporate garage. 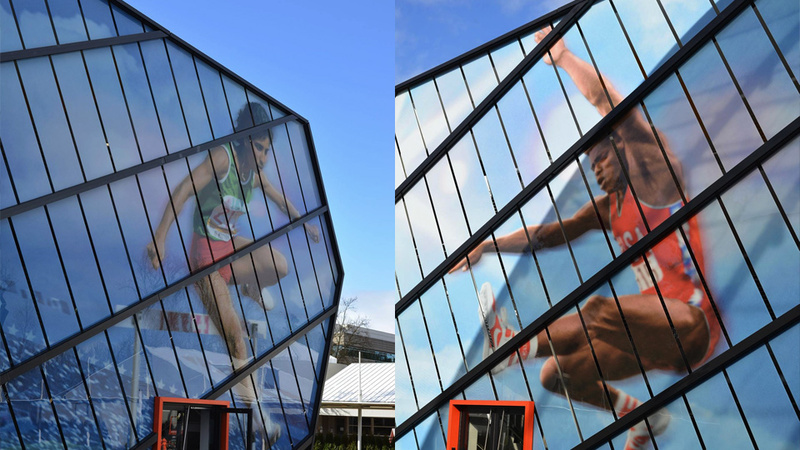 Digitally printed photographs of world-class Olympic athletes in huge scale reinforces the company's mission. Moon Shadow Glass is known for high-quality decorative glass fabrication, superior customer service and on-time delivery. Unmatched decorative glass capability and exceptional craftsmanship -- that’s what we are about. With over 30 years of creating decorative glass, we can truly state that, "if it can be done with glass - we can do it." Surface etched and carved glass, decorative laminated glass, transit station glass, residential and commercial decorative glass, glass and magnetic signage, windows, walls, glass furniture and more. We can handle just about any piece of glass with security and safety (important when lifting and moving large pieces of glass).